How does Home Movie Day work? 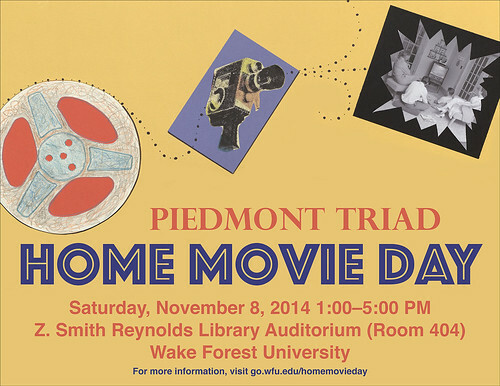 We’re counting down the days to the first ever Piedmont Triad Home Movie Day! How does Home Movie Day work? We’re glad you asked! WHEN: Saturday, November 8, 1:00–5:00 p.m. Faculty, staff, and students of Wake Forest may park in lots that correspond with their parking decal. Visitors may park in any general or visitor parking lot on campus. See parking.wfu.edu and the Wake Forest University Parking Map [PDF] for more information. Following the panel discussion, we’ll start screening home movies. The heart of every Home Movie Day is seeing your films projected on the big screen. Home Movie Day events provide the opportunity for individuals and families to see and share their own home movies with an audience of their community, and to see their neighbors’ in turn. You are also welcome to drop in as you are able to see what others have to share. We will be sharing films from the collections of A/V Geeks, Davidson College, UNCSA, and Wake Forest. As a very special treat, Mr. Wake Forest himself (Provost Emeritus Edwin Graves Wilson) will speak as we show silent footage of Wake Forest’s original campus in Wake Forest, NC! Hope to see you there!